Fig. 5 Aggregate supply schedule. a schedule depicting the total amount of domestic goods and services supplied by businesses and government at various levels of total expenditure. The AGGREGATE SUPPLY schedule is generally drawn as a 45° line because business will offer any particular level of national output only if they expect total spending (AGGREGATE DEMAND) to be just sufficient to sell all of that output. Thus, in Fig. 5 (a), £100 million of expenditure calls forth £100 million of aggregate supply, £200 million of expenditure calls forth £200 million of aggregate supply, and so on. This process cannot continue indefinitely however, for once an economy's resources are fully employed in supplying products then additional expenditure cannot be met from additional domestic resources because the potential output ceiling of the economy has been reached. Consequently, beyond the full-employment level of national product, Yf, the aggregate supply schedule becomes vertical. See POTENTIAL GROSS NATIONAL PRODUCT, ACTUAL GROSS NATIONAL PRODUCT. Alternatively, the aggregate supply schedule can be expressed in terms of various levels of real national income supplied at each PRICE LEVEL as shown in Fig. 5 (b). This version of the aggregate supply schedule parallels at the macro level the supply schedule and SUPPLY CURVE for an individual product, though in this case the schedule represents the supply of all goods and services and deals with the general price level rather than a particular product price. Fig. 5 (c) shows a shift of the aggregate supply curve to the right as a result of, for example, increases in the labour force or capital stock and technological advances. 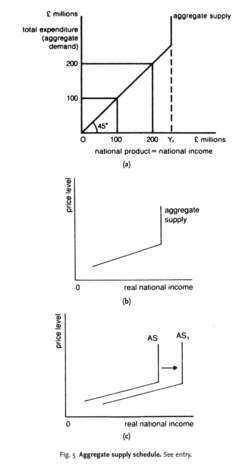 Aggregate supply interacts with aggregate demand to determine the EQUILIBRIUM LEVEL OF NATIONAL INCOME. Demand management treats the aggregate supply schedule as fixed. Finally, although asymmetric indexation potentially might help explain why the economy's aggregate supply schedule might be kinked, so that asymmetries of the type documented by Cover  and Kandil [1995, 1998] might arise, the extent of its ability to do so in the context of this paper's model is very limited. Summers believes that the premise that "a downward sloping aggregate demand schedule and an upwards sloping aggregate supply schedule intersect to determine uniquely and sharply the level and of output and prices is untenable.